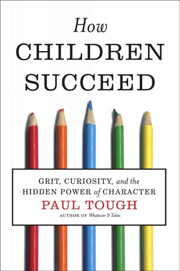 Although the title of Paul Tough’s recent book, How Children Succeed: Grit, Curiosity, and the Hidden Power of Character, suggests either a parental advice guide or a nostalgic call for a return to the Protestant work ethic, it is in fact neither. Instead, the book is Tough’s shot at discrediting the cognitive hypothesis: “the belief, rarely expressed aloud but commonly held nonetheless, that success today depends primarily on cognitive skills—the kind of intelligence that gets measured on IQ tests.” How Children Succeed documents compelling stories of innovative primary and secondary school teachers and administrators who find success by focusing on developing their students’ characters in addition to their minds. Tough annotates these stories with a wide range of contemporary theories on learning and development to present the case that what is missing from education is a nuanced understanding of how children develop character. The results are convincing enough to think he is on to something. Tough’s biggest complaint with the status quo is that it focuses on developing the intellect and ignores the development of the person who will use that intellect. He believes that educational reformers have overinvested in cognitive skills. The book does not deny that a person’s intelligence plays a vital role in success, nor does it question whether frequent and dedicated practice from a young age will develop cognitive skills. Instead, How Children Succeed doubts the zealous faith in the importance of early cognitive development that leads overanxious parents to enroll their children in pre-schools that offer early instruction in reading and math while sacrificing much of what used to be pre-schools’ primary focus: developing the social and emotional skills necessary for primary school. Although the book offers insights applicable to all American children, it is clear that Tough—whose first book, Whatever It Takes (Houghton Mifflin Harcourt, 2008), chronicled the efforts of educational reformer Geoffrey Canada’s efforts to overhaul the Harlem school system—feels passionately about the plight of children in poverty. Tough presents a sobering look at the effects poverty and other childhood traumas can have on a child’s long term success. Children who grow up in the type of stressful environments that poverty tends to produce fail to develop parts of their brain properly, especially the prefrontal cortex, which plays a vital role in the regulation of attention, emotions, stress, and self control. As he shows in several case studies, many children in poverty fail in school because they do not develop self control and other fundamental skills needed for learning. These ills are not, however, limited to students trapped in poverty. Tough also reports on students from affluent backgrounds who face pressures to succeed academically with little attention to developing the character attributes necessary for dealing with the stress that comes from high stakes academic performance; consequently, affluent teens exhibit disproportionately high rates of depression, anxiety, and drug use. How Children Succeed reads a bit like pop psychology, similar to the type of books Malcolm Gladwell is known for. Tough’s storytelling is not quite as engaging as Gladwell’s, but that might be because his science is better. Whereas Gladwell draws criticism for cherry picking a small sample of psychological studies and loosely interpreting their results, Tough’s work can sometimes feel disjointed because of the breadth of the works he considers. Tough presents a complex picture of childhood development that draws on recent studies in psychology, sociology, and physiology. Almost without exception, these studies formulate theories that are fascinating because they are so counterintuitive to the way most of us think about learning. Tough weaves into his book the theories of some of the foremost scholars on thinking and learning, including Carol Dweck, Claude Steele, Martin Seligman, and Mihály Csíkszentmihályi, each of whom have condensed their ideas into popular books of their own. However, the comparatively unknown Angela Duckworth, whom Tough calls “the guru of self-control and grit,” provides the backbone of the book’s argument about character. Duckworth’s work provides a list of seven character strengths that most interest Tough. Those strengths—grit, self-control, zest, social intelligence, gratitude, optimism, and curiosity—are “especially likely to predict life satisfaction and high achievement.” Of these, Duckworth finds that grit, which involves “a passionate commitment to a single mission and an unswerving dedication to achieve that mission,” is the most useful at predicting who will persist and succeed at difficult tasks, and she has some intriguing evidence to back that up. Her twelve-question Grit Scale predicts who will persevere at challenging tasks and has been shown to be accurate in everything from determining who will make it to the later rounds of the National Spelling Bee to who will complete the brutal Beast Barracks summer training course at West Point. How Children Succeed likely won’t bring about the type of paradigm shift it sees as a necessary foundation for the successful reform of the American educational system. It can, however, encourage readers to reconsider some of what they believe about a successful education. At the very least, the book provides a fair amount of water cooler fodder for parents, teachers, or anyone interested in education reform. This entry was posted in Uncategorized and tagged Spring 2013 on October 30, 2013 by admin.